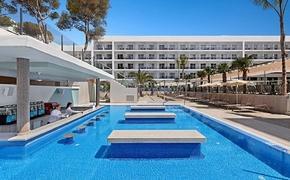 Hard Rock International introduced Hard Rock Hotel Palm Springs on March 6 with a high-octane grand opening celebration. Commemorating the brand's introduction to the famed Desert Valley hotspot, guests witnessed the hotel debut with the popular indie headlining electronic rock duo, Phantogram, performing poolside. Celebrities including The Mindy Project’s Anders Holm and reality star Audrina Patridge all stepped out to greet California's second Hard Rock Hotel. "We are proud to present Hard Rock Hotel Palm Springs and welcome the newly unveiled property to Hard Rock Hotels & Casinos, a collection that truly paves the way and exceeds guest expectations with every facet of the lifestyle hotel experience," said hotel owner Andy Carpiac of Kittridge Realty. In true rock star fashion, guests were greeted upon arrival by an entry buzzing with media and spectacular surroundings, including illuminated dancers and top-of-the-line light shows. Setting the tone for the night, The Embassy — a Los Angeles-based DJ group including Paul McCartney's DJ, Chris Holmes — rocked the house, while several local radio stations broadcasted live from the event. Sponsored by Grey Goose and Bacardi, the party kicked off with the unveiling of a VIP lounge in the lobby's Rock Pit, where guests enjoyed signature appetizers and cocktails while mingling with prominent Hollywood and music personalities. Grand opening attendees also received a free Beats Music subscription trial and witnessed collaborative, Hard Rock-specific projections on the hotel. Hard Rock's well-known vibe was as present as ever. Guests took to the turntables and tried their hands at mixing beats like a pro, while others opted to strum exclusive Fender guitars as part of the brand's all-encompassing global music amenity program, The Sound of Your Stay. "We are thrilled to continue expanding the Hard Rock Hotel brand, bringing something special to the music mecca of Palm Springs, an area so rich in history and culture," said John Galloway, Vice President and Chief Marketing Officer at Hard Rock International. "We look forward to connecting with music lovers worldwide and seeing the new property blossom into one of Southern California's most sought-after entertainment destinations." 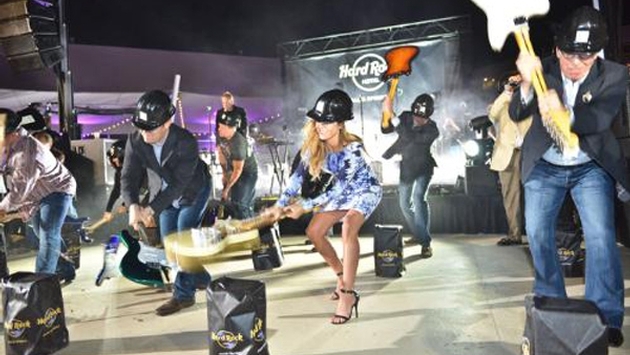 The classic Hard Rock Guitar Smash, which marks the opening of each new property, officially inaugurated Hard Rock Hotel Palm Springs as the brand's latest hotel. Featuring some of the event's top celebrities and Hard Rock International executives, the Guitar Smash thrilled those in attendance and amplified the night's energetic atmosphere. Hard Rock Hotel Palm Springs is a music-inspired resort offering 163 luxury guest rooms, a buzzing pool and entertainment scene with DJs spinning every weekend, plus dining and events in the heart of Downtown Palm Springs. The hotel offers a long list of amenities, including the advanced, interactive Sound of Your Stay amenity, where guests can rock out with hands-on music experiences. Other music-inspired amenities include a VIP Rock Star Suite, a Rock Spa, a Body Rock workout facility, and the popular Rock Shop featuring Hard Rock's iconic, collectible merchandise.